Reach the final chapter of the digital edition of Resident Evil Revelations 2 (Resident Evil Revelations 2 Episode 4: Metamorphosis), the time to discover the secrets surrounding Claire, Moira, Barry and Natalia. Find out if it lives up to your expectations. Resident Evil Revelations 2 has been confirmed as a solid game by Capcom in episodic format, taking advantage of the idea of launching a weekly delivery to try your luck and see if the model is feasible in the face of upcoming releases. Having already completed the four available on its digital release - get two extra, that will only physical version and we could not play- it's time to make the last of all. Is the height "Metamorphosis", the fourth episode, what should be a 'season finale'? The truth is yes and no. The contradiction will understand once we start to talk in detail about each of its two halves, as usual, so without further ado let’s discuss the details of this season finale. Not before, yes, put in a situation to what happened before without going into spoilers and give some context to the uninitiated; any. We start the episode with Claire and Moira. 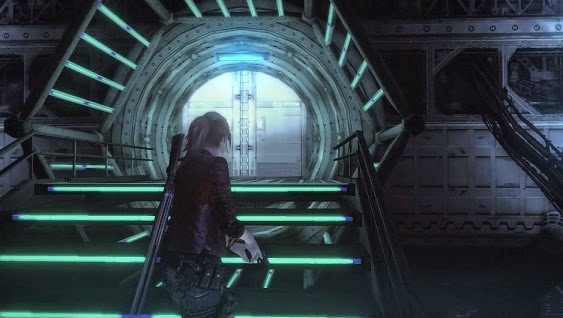 Both are in the same complex where you were attacked in "Judgment", so your goal is basically to reach the "Authority" which at this stage of the game already has a name, but we know from the story of Barry and discover the plan by which they were abducted and sent to the maximum security prison. After a strong narrative sequence, we get finally at the controls of the characters at a time of flight. It is not particularly complex but breaks with standard hard hit shots and the interaction between the characters, in a game of this nature does not hurt. And when we realize, comes another video sequence ... and the end of the chapter. When the timer which excludes cinematic points to 15 minutes, things get tense. Basically, we spent almost an hour and a half in "Judgment" 15 minutes "Metamorphosis". This decision is justified by an abrupt end in the plot, which will not talk, but left with the fear that the whole episode is to be limited to close the story without allowing just play. When Barry and Natalia control, things change. In "Judgment" we complain that the segment was very long but artificially forcing roam around a bit interesting with the excuse to delay the real fun time scenario. Here the thing is similar although less narrative level is very, very superior, and there is more variety in environments with a very interesting segment in the last section in which is placed in contention exploration (relatively) and values to tell the story. With Barry began, then, where we left off in the previous and the initial goal is to reach a facility located at the top of a mountain. If you remember how it ended "Trial", you will know why. The goal is to end Barry definitely the monster that took the life hypothetically her daughter. And discover what place Natalia throughout this scrub, while the champions, after seeing their relationship became more fraternal in the latest installment of Revelations 2. The first segment of the resolution of a particularly simple puzzle and eventual defeat some enemies. The episode with less action of the four segments featuring Barry in this series, but somehow compensated with interesting ideas that can not disclose that your enjoyment is not undermined by playing the title. For when we have almost two hours in its chapter, everything ends and Revelations 2 puts an end to an interesting bet on paper, performed strongly in its first episodes but has failed to soar, falling towards the end something as ridiculous as the 'filler'. Lasting less than eight hours. Some might enjoy roughly the end, that's something that goes tastes, but as 'season finale' works, yes, as a narrative: it contains the key that would give rise to a Revelations 3 of identical structure. But as playable. "Metamorphosis" closes in style in plot and has a stronger segment for Barry / Natalia than "Doom", but instead sacrifices of Claire / Moira, dispatching it with just 15 minutes of actual game. This is the great black point of an episode that disappoints those points but, of course, maintains the mechanical strength of the above and of course, adds even more extras to Assault mode, which is what makes Revelations 2 is a title more solvent than if only it is limited to the campaign. If you are waiting to see if as a whole the 'series' worth, I would say yes but going from more to less. Of course, in its physical release will include two more episodes, "The Struggle" and "Little Miss."